Sensors & Actuators: A. Physical, 248 , pp. 184–192, 2016. 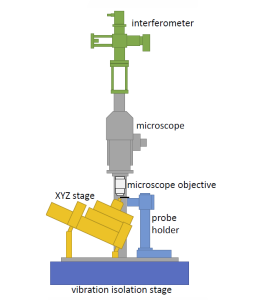 This article presents a novel vertical positioning stage with a dual-sensor arrangement suitable for scanning probe microscopy. The stage has a travel range of 8.4um and a first resonance frequency of 24kHz in the direction of travel. The sensor arrangement consists of an integrated piezoelectric force sensor and laminated piezoresistive strain sensor. The piezoelectric force sensor exhibits extremely low noise and introduces a zero into the dynamics which allows the use of integral force feedback. This control method provides excellent damping performance and guaranteed stability. The piezoresistive sensor is used for tracking control with an analog PI controller which is shown to be an approximate inverse of the damped system. 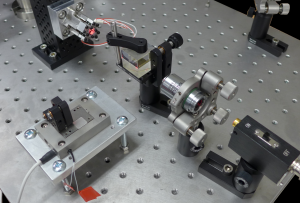 The resulting closed-loop system has a bandwidth is 11.4kHz and 6-sigma resolution of 3.6nm, which is ideal for nanopositioning and atomic force microscopy (AFM) applications. The proposed vertical stage is used to replace the vertical axis of a commercial AFM. Scans are performed in constant-force contact mode with a tip velocity of 0.2mm/s, 1mm/s and 2mm/s. The recorded images contain negligible artefacts due to insufficient vertical bandwidth. Review of Scientific Instruments, 87 (085104), pp. (1-8), 2016. This article presents a high-speed single- and dual-stage vertical positioner for applications in optical systems. 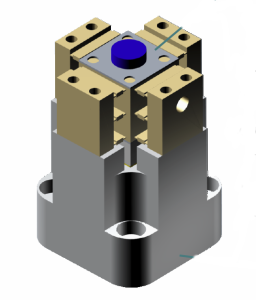 Each positioner employs a unique end-constraint method with orthogonal flexures to preload a piezoelectric stack actuator. This end-constraint method also significantly increases the first mechanical resonance frequency. 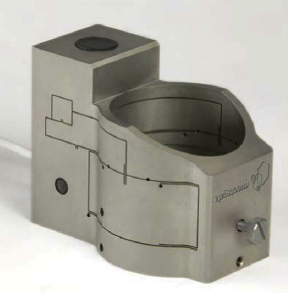 The single-stage positioner has a displacement range of 7.6um and a first resonance frequency of 46.8kHz. The dual-stage design consists of a long-range slow-stage and a short-range fast-stage. An inertial counterbalance technique was implemented on the fast-stage to cancel inertial forces resulting from high-speed motion. The dual-stage positioner has a combined travel range of approximately 10um and a first evident resonance frequency of 130kHz. 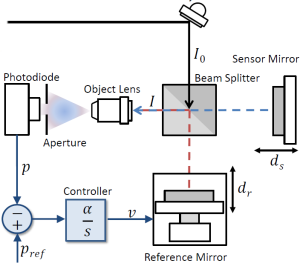 This article presents a high-speed single-stage and dual-stage mirror scanner for applications in optical systems. 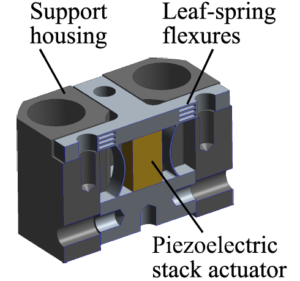 Each scanner employs a unique end-constraint method with orthogonal flexures to preload a piezoelectric stack actuator. This end-constraint method also significantly increases the first mechanical resonance frequency. 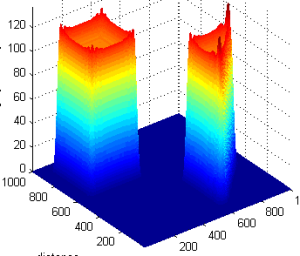 The single-stage scanner has a displacement range of 7.6 m and a first resonance frequency of 46.8 kHz. The dual-stage design consists of a long-range slow-stage and a short-range fast-stage. An inertial counterbalance technique was implemented on the fast-stage to cancel inertial forces resulting from high-speed motion. The dual-stage scanner has a combined travel range of approximately 10 m and a first resonance frequency of 130 kHz. IEEE Multiconference on Systems and Control, Sydney, 2015. Mechatronics, 24 (6), pp. 701-711, 2014. This paper describes a new vibration damping technique based on Integral Force Feedback (IFF). Classical IFF utilizes a force sensor and integral controller to damp the resonance modes of a mechanical system. However, the maximum modal damping depends on the frequency difference between the system’s poles and zeros. If the frequency difference is small, the achievable modal damping may be severely limited. The proposed technique allows an arbitrary damping ratio to be achieved by introducing an additional feed-through term to the control system. This results in an extra degree of freedom that allows the position of the zeros to be modified and the maximum modal damping to be increased. The second contribution of this paper is a structured PI tracking controller that is parameterized to cancel the additional pole introduced by integral force feedback. 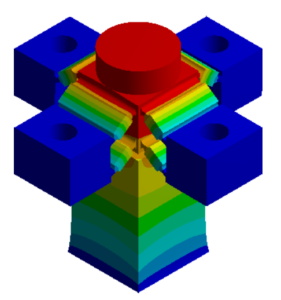 The parameterized controller has only one tuning parameter and does not suffer from reduced phase margin. The proposed techniques are demonstrated on a piezoelectric objective lens positioner. The results show exceptional tracking and damping performance while maintaining insensitivity to changes in resonance frequency. The maximum bandwidth achievable with a commercial PID controller is 26.1 Hz. In contrast, with the proposed damping and tracking controller, the bandwidth is increased to 255 Hz.